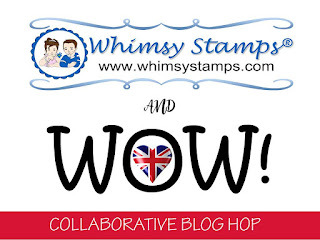 WELCOME to the Whimsy Stamps and WOW! Embossing Powder Blog Hop! The winners will be chosen at random during the week of April 22nd from all the comments left on the posts. This hop is open for both the USA and internationally. Have FUN hoping along and ENJOY all the inspiration both teams have created for you. For one of them I used the Whimsy Stamps Wonky Window 1 die to cut out the plain black frame. You can toss the black inside pieces or save them for another project. I glued the full white embossed piece onto a black card base, then glued the plain black Wonky Window frame directly on top. I used the Wonky Window 1 die and cut out all 3 sheets of the fluorescent colored backgrounds making sure I had each one in the same orientation and so the pattern would line up when pieced together. Once they were all die-cut I chose the pieces/color arrangement I liked best and glued the blue, green, and violet pieces inside the frame directly on top of the white. And BONUS...there are several left over pieces and really cool frames that you can make additional cards with too! For the final touch I used the smallest of the NEW Wavy Stitched Squares for the sentiment and adhered that in the largest window opening using foam tape for dimension. 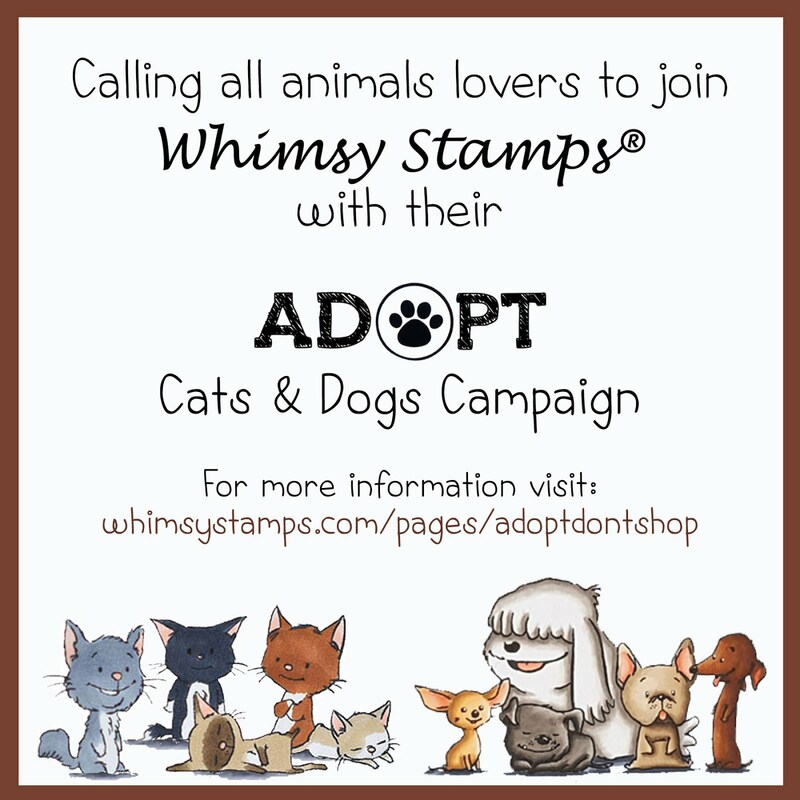 The sentiment is from the NEW Cloud Animals clear stamp set. I used mostly the same products on both of these cards and the WOW! Fluorescent Embossing Powders look so cool on black I just had to use them again. 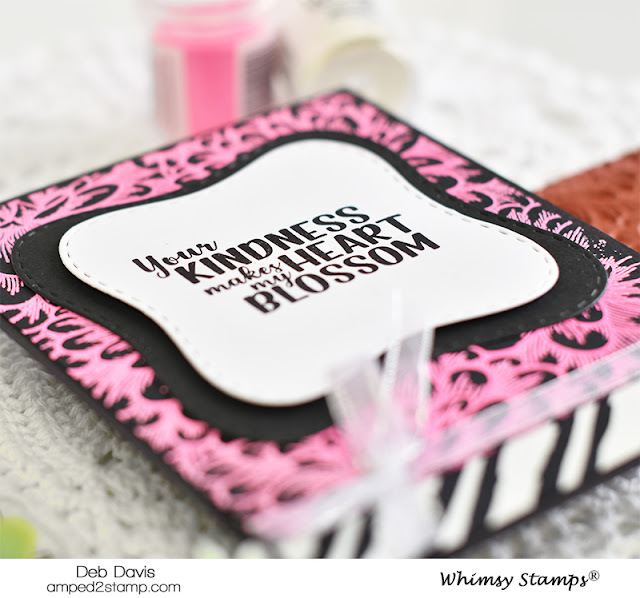 So I stamped the same Flower Puffs background with versamark ink and Fluorescent Pink EP. For the bottom of the card I used the Whimsy Stamps Brushed Stripes background on black card stock with WOW! White Puff embossing powder. I LOVE pink and black and white together, it's one of my favorite color combos. For the sentiment I used a couple of the bigger sized dies from the Wavy Stitched Squares, this is a really fun die set that is a nice change from plain ol' squares. And the sentiment is from the Beaucoup Bouquet clear stamp set that has a nice variety of any occasion sentiments especially good for your floral cards too. 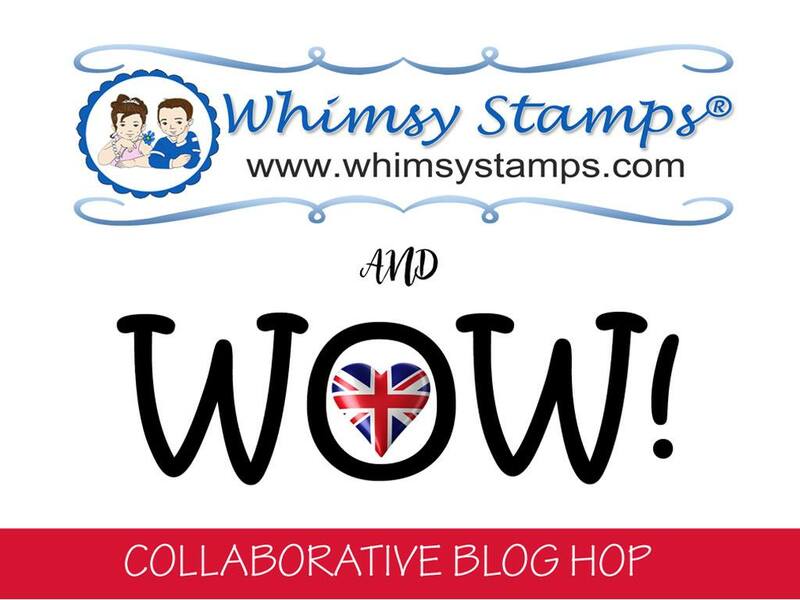 Don't forget to click on the word bubble (at the very bottom of this post) and leave a comment for your chance to win one of the Whimsy Stamps or WOW! Embossing Powder prizes. And be sure to leave a comment at every stop along the hop. I absolutely love the vibrant colors on the black card stock! Love these colored powders on the Flower Puffs design! Great dies too! Awesome cards! SOOOOO COOL! I love those bright embossing powders and the pattern you did!!!! Gorgeous cards.....I fell in love with the Wonky Windows die....that was just such a fun application in which to use it. Great work. And OH, I am going to hurt in the pocket book, because I am seeing things that I just must order. Thank you so very much for sharing your great work today....Off to hop now...have an awesome weekend. Wow! really makes some beautiful powders. 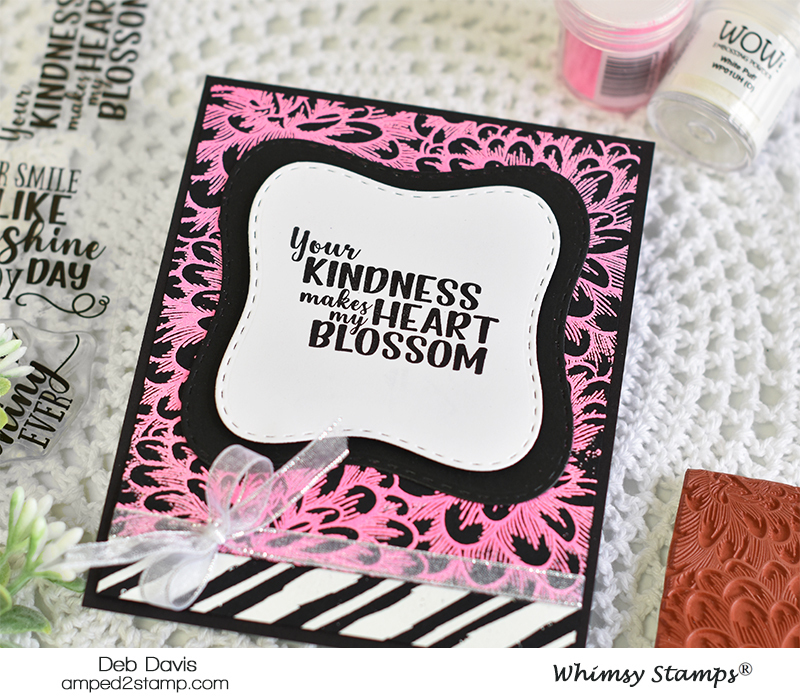 What a fantastic use of the embossing powder for the background! Very pretty! Loving the bright colors! Great powders! The fluorescent embossing powders really brightens up your cards. Beautiful! Oh, I think I need more embossing powders as well as that wonky window die. 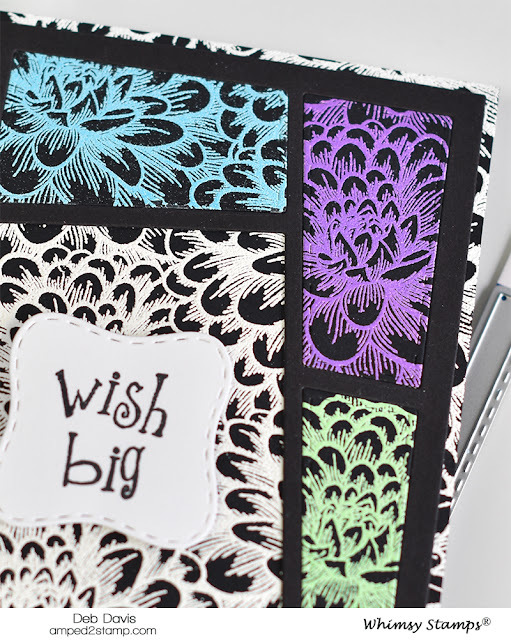 Love your bold and striking colours against the black cardstock. I love your cards. 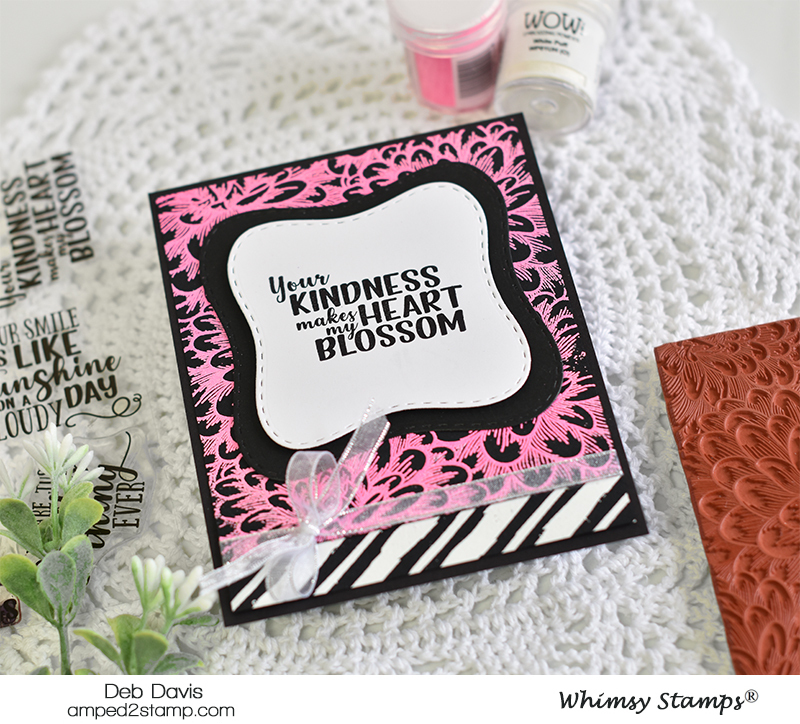 The flower puff stamp with embossing powder creates such a nice card! And I really like the wonky window die. Wow! I'm totally in love for your beautiful cards! Colouring is great!!! Pretty designs and I like the colors.